The Delightful Rain CD & DVD was released 14th October 2006. PDF file 62.7KB) from InPress magazine 15th November 2006. Martin will be doing a live to air interview about Delightful Rain. 7.45PM AEST / 4.45PM WA Time. ABC REGIONAL DRIVE – WEST AUSTRALIA. With Helena Webb. Watch the Atlantics play Bombora on Studio 22, from ABC TV. Check out the new improved guitar gallery, including the 1954 Strat, a 1964 Gibson Firebird III, a 1954 Gibson ES175D and other interesting items. 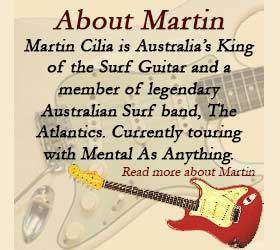 Martin has done some music for the ABC-TV “Collectors” program. The segment was about vintage guitars. In April of this year Martin’s band “Blue Lounge ” played at the Empire Hotel in Sydney as part of a benefit for Max Paton (see a review of the night here: 2 Good 4 Words, Australian instrumental Newsletter, May edition). Also on the bill were the Bluesbusters including Theo Penglis – the original guitarist for the Atlantics. This was the first time the old and new Atlantics members had met. Peter Hood (drummer) was also in the audience and met up with the guys. Martin’s original 1954 Fender Stratocaster is featured in Australian Guitar VOL 54, page 98 “Rare Find”. On the cover CD you can hear “Return of the Dolphins” by The Atlantics featuring the 1954 strat. The author of the article, Dean Thomas, has graciously allowed us to post the full text of the article on the site. Read the article here. Martin played at Shadoz 2006, July 12th, at the Croxton Park Hotel in Thornbury with “The Flying Bombora Brothers” (John Hall – Drums, Con Anag – Guitar, John Archer – Bass & Martin – Guitar). See some photos in the gallery. The ABC Studio 22 program featuring the Atlantics was replayed on ABC2 (ABC Digital TV) on Saturday June 24th at 10.30pm. This was recorded in early 2000 and features many songs Flight of the Surf Guitar, as well as some old classics. Go to the ABC website for more details. Martin has recently recorded some new songs with The Atlantics as part of the Delightful Rain project. They were recorded live on location at Freshwater Surf Club on Sydney’s northern beaches in mid May 2006.